MANILA, PHILIPPINES - The Professional Regulation Commission (PRC) announced the official results of March 2018 Medical Technologist or MedTech board exams three (3) working days after the last day of exams. These include the official list of passers, top examinees, top performing schools and performance of colleges and universities, oath-taking schedule, registration requirements, among other important announcements. 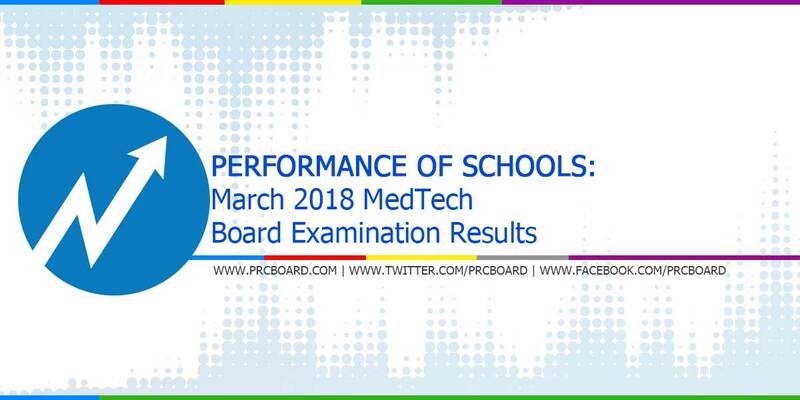 PRC recognizes the top performing schools (colleges and universities) in the March 2018 MedTech board exams. Shown below is the complete list of schools' performance for MedTech licensure exam as well as the top performing schools with 50 or more examinees passed and with at least 80% overall passing percentage; as per Commission Resolution No. 2010-547 series of 2010, courtesy of PRC. Meanwhile, to keep updated on the official result of MedTech licensure exams, you may also follow us at our social media accounts via Facebook and Twitter. paupdate nyo na poh please nang matapos na ang paghihirap namin.. maraming salamat poh..
Bakit po wala pangalan ko? I think the University of San Agustin should be on the list of top Performing School.. please check..